Danish designers Komplot have created a set of concrete furniture for Swedish brand Nola. 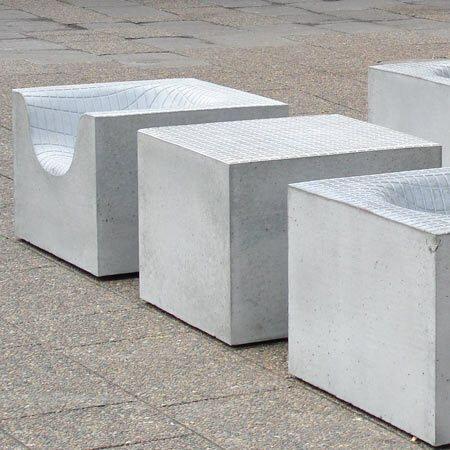 Called Concrete Things, the chairs consist of concrete blocks with seats hollowed out, marked with a grid that was inspired by paving. The project will be on show at CODEO9 as part of Copenhagen Design Week, which begins tomorrow. Six of the blocks are located outside Rigshospitalet in Copenhagen. ”Concrete Things” – series of outdoor concrete furniture questioning the relation between the individual and the collective in public space. Simple geometric shapes with pavement inspired grid, which deformation keeps memory of somebody once seated in them. 2009 PURCHASED BY NATIONAL ART FOUNDATION and placed besides the entrance to Rigshospitalet - Copenhagen University Hospital.